The head gasket is a ringed panel that is placed between the cylinder head and engine block. The head gasket is put in place as a barrier that prevents engine fluids from leaking into the cylinders. Also, it is among the most vital components in the combustion chamber. In addition to serving as a barrier to the cylinder, the head gasket blocks off conduits to the oil and water. Since it’s between hot and cold engine components, the head gasket faces a full range of temperatures. This ranges from the high heat of the combustion chamber to the often cold temperatures of the cooling system. As the impacts of temperature changes take their toll over time, the head gasket can ultimately bear marks along the surface. Leaks do often develop along this crucial area. If the problem worsens, the gasket can blow. If an issue comes up, make sure to contact us. That way we can inspect the vehicle for you. Several things can cause a blown head gasket. This could be anything from the coolant system to the combustion chamber could be responsible. 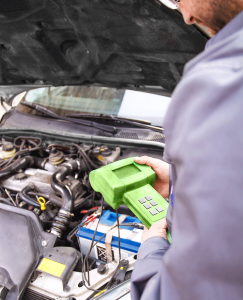 In certain cases, a symptom might show due to multiple failures within the engine. Overheating could be caused by a restricted radiator, which can get worse the farther you drive along. Coolant in the oil, usually blamed on head gaskets, could actually be due to problems with the intake gasket. Symptoms such as these may or may not be due to the head gasket. Some ignore blown head gasket symptoms due to the costs that come with repairs. This can be an even more costly mistake since blown head gaskets lead to further car trouble if you continue driving. A coolant leak could lead to other problems. This can include damage to the catalytic converter. Leaks into the engine oil, which can ruin the engine. Also overheating caused by mixtures of coolant and combustion gases. Another problem can include corrosion to the engine parts like the radiator and heater. If you do notice something out of the norm, make sure to schedule an appointment with us. This entry was posted in Engine, Engine head gasket, General Car Maintenance, Head gasket. Bookmark the permalink.